A growing specialist Hull commercial and hazardous waste business has created new jobs and invested more than £500,000 into a new fleet of specialist vehicles and equipment to ensure it maintains its impressive rate of growth in 2019 and beyond. Wastege Waste Management Ltd was established by experienced specialist Mark Taylor after 30 years in the waste industry, with the firm boasting a management team with expertise covering every aspect of the sector. The business focuses on ensuring its clients remain compliant with ever-changing environmental legislation, a key area given the huge fines handed out to those not handling and disposing of waste – particularly hazardous materials and chemicals – as the law requires. It uses its own licensed transfer facility in East Yorkshire to treat hazardous wastes and make them ready for waste recovery or incineration disposal purposes. 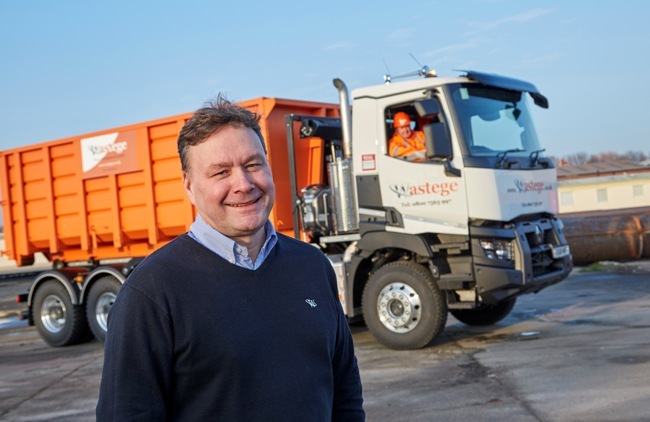 “The Wastege brand is going to be much more visible across the region in 2019 as the work we have secured for the 12 months ahead, and beyond, has required us to invest back into the business and into more specialist vehicles which will be on the roads daily,” managing director Mr Taylor said. The company manages and a variety waste streams from a wide spectrum of industry across the UK, including general industrial waste, recycling of cardboard, plastics and metal waste and the handling and disposal of all types of hazardous wastes, including flammable, corrosive and toxic waste materials as well as dismantling and dealing with asbestos waste. “We have shown we can taske on significant work, and when needs be we are a business that will invest to ensure we maintain the highest standards and deliver a quality service to our customers,” Mr Taylor added. The business, which has its head office in Wincolmee, Hull, and a base in West Thurrock, London, has quickly established a reputation as one of the region’s most compliant and fast-growing waste management companies. Its teams works at many of the UK ports analysing, packaging and disposing of fuels and chemical samples, and it has been called upon to carry out emergency waste clearance by organisations such as local authorities and the Environment Agency. He said: “We are absolutely thrilled by the scale of work we have increasingly undertaken and the prestige of the clients turning to us. They are coming to us because of our reputation and growth, which is really pleasing. “We now have many excellent long-term retained clients growing our operations nationally. This has already enabled us to invest further in our business and create jobs this year. “We have employed four new drivers, a commercial manager to oversee the work and extra staff in accounts and administration. “When I launched the company I ensured we did everything in the right manner. We combine specialist knowledge with new technologies, the latest equipment and innovative ideas within the waste management industry.